Tricyrtis are hardy or half-hardy perennials. They bloom sporadically from the middle of summer through to early autumn. When in bloom they carry upturned bell shaped flowers that are usually freckled; these may be red, purple, pink, yellow or white. 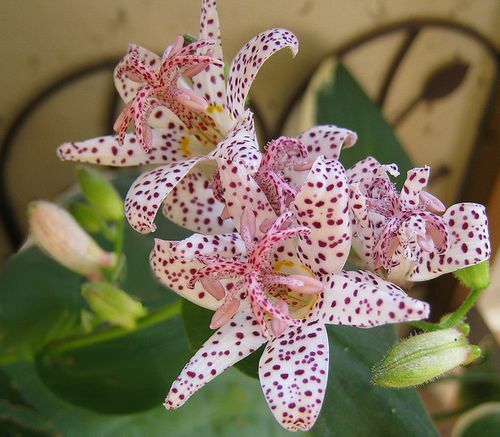 A common name for a member of Tricyrtis is the Toad Lily. Height: 24 to 60 inches (60—150 cm). Flowers: Middle of summer to autumn. Flower Details: Pink, red, yellow, purple, white. Orchid-like. Freckled / spotted. Star or bell-shaped. Waxy. Thick. Some species have solitary flowers while others contain up to 50 flowers on terminal or axillary clusters. Six tepals in two whorls. Foliage: Herbaceous. Alternate. Lance-shaped. Stems are usually stiff and erect, but may be arched. Clump-forming habit. Sow Outside: Seeds: 1/8 inch (3 mm). Before the last light frost of spring or towards the end of autumn. Sow Inside: Germination time: one to three months. Temperature: 68°F (20°C). Seven or eight weeks in advance. Use peat pots and add a layer of grit to the top. Transplant outdoors following the last frost or in autumn. Space at 4 to 8 inches (10—20 cm). Requirements and care: Partial shade to full sunlight (in colder areas). Slightly acidic woodland soil. Moist, peaty, and rich in organic matter. Regular watering during dry periods. Bring indoors in the autumn in cold areas. Protect from slugs. Propagate: by dividing in the spring. Miscellaneous: These plants are known as Hototogisu (cuckoo) in Japan, this name is derived from the spotted nature of the flowers. Toad Lilies are not the easiest plants to grow from seeds and you may consider purchasing them from a garden centre or from divided plants. The seeds of Tricyrtis plants should be sown at a depth of 3 mm in either autumn, or before the last frost of spring. They should be grown about 10 to 15 cm apart and prefer a partially shaded part of the garden. Ideally the soil that they grow in will be rich, slightly acidic, peaty, and moist. If you want to attempt growing indoors then sow the seeds into peat pots about a month and a half before you expect the last frost. It can take from one to three months to germinate the seeds, and should be performed at 18 to 21 degrees Celsius. Transplant outdoors following the last frost of spring. Though fairly difficult to grow from seed it is fairly easy to care for toad Lily and other Tricyrtis members once they are growing. 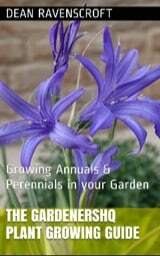 During hot and dry spells they should be watered regularly to keep the soil moist. The plants require a mulch in the spring time to help keep soil cool and moist. If you require more plants then toad lily can be propagated by division in the spring.